Plants short-lived perennials; not stoloniferous. Culms 25-60 (75) cm, stiffly erect or slightly geniculate-spreading basally; ligules 0.1-0.5 mm; blades 6-10 cm long, 1-4 mm wide. 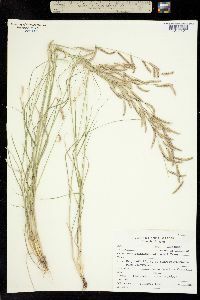 Panicles (3.5)5-25 cm, with 3-8 branches; branches 15-30 mm, scabrous, with 35-50 (55) spikelets. 2n = 40. Bouteloua barbata var. rothrockii grows on dry slopes and sandy flats, mostly at 750-1700 m. It grows throughout the southwestern United States and Mexico, sometimes covering large areas. It used to be the most important forage grass in southern Arizona and neighboring regions. 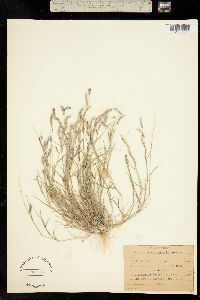 Bouteloua barbata var. rothrockii resembles var. parryi, but can be easily distinguished from that taxon by the lack of papillose-based hairs on the keels of its upper glumes. Perennials, Terrestrial, not aquatic, Stems nodes swollen or brittle, Stems erect or ascending, Stems geniculate, decumbent, or lax, sometimes rooting at nodes, Stems caespitose, tufted, or clustered, Stems terete, round in cross section, or polygonal, Stem internodes hollow, Stems with inflorescence less than 1 m tall, Stems, culms, or scapes exceeding basal leaves, Leaves mostly basal, below middle of stem, Leaves mostly cauline, Leaves conspicuously 2-ranked, distichous, Leaves sheathing at base, Leaf sheath mostly open, or loose, Leaf sheath smooth, glabrous, Leaf sheath hairy at summit, throat, or collar, Leaf sheath and blade differentiated, Leaf blades linear, Leaf blades very narrow or filiform, less than 2 mm wide, Leaf blades 2-10 mm wide, Leaf blades mostly flat, Leaf blade margins folded, involute, or conduplicate, Leaf blades more or less hairy, Ligule present, Ligule a fringed, ciliate, or lobed membrane, Inflorescence terminal, Inflorescence with 2 or more spikes, fascicles, glomerules, heads, or clusters per culm, Inflorescence a panicle with narrowly racemose or spicate branches, Inflorescence with 2-10 branches, Inflorescence branches 1-sided, Inflorescence branches terminating in bristle or point, Flow ers bisexual, Spikelets sessile or subsessile, Spikelets laterally compressed, Spikelet less than 3 mm wide, Spikelets with 1 fertile floret, Spikelets solitary at rachis nodes, Spikelets all alike and fertille, Spikelets bisexual, Spikelets disarticulating above the glumes, glumes persistent, Spikelets secund, in rows on one side of rachis, Rachilla or pedicel glabrous, Glumes present, empty bracts, Glumes 2 clearly present, Glumes distinctly unequal, Glumes shorter than adjacent lemma, Glumes 1 nerved, Lemma coriaceous, firmer or thicker in texture than the glumes, Lemma 3 nerved, Lemma body or surface hairy, Lemma apex dentate, 3-5 fid, Lemma distinctly awned, more than 2-3 mm, Lemma with 3 awns, Lemma awn less than 1 cm long, Lemma awns straight or curved to base, Lemma margins thin, lying flat, Lemma straight, Lemma surface pilose, setose or bristly, Palea present, well developed, Palea membranous, hyaline, Palea shorter than lemma, Palea 2 nerved or 2 keeled, Stamens 3 , Styles 2-fid, deeply 2-branched, Stigmas 2, Fruit - caryopsis, Caryopsis ellipsoid, longitudinally grooved, hilum long-linear.